Learn more about this amazing addition to our family here. With Watson Machine Learning Accelerator you can drive faster time to results and accuracy, running in special AI hardware in the Cloud on On-Premises. WML Accelerator comes with SnapML library. We have developed an efficient, scalable machine-learning library that enables very fast training of generalized linear models. 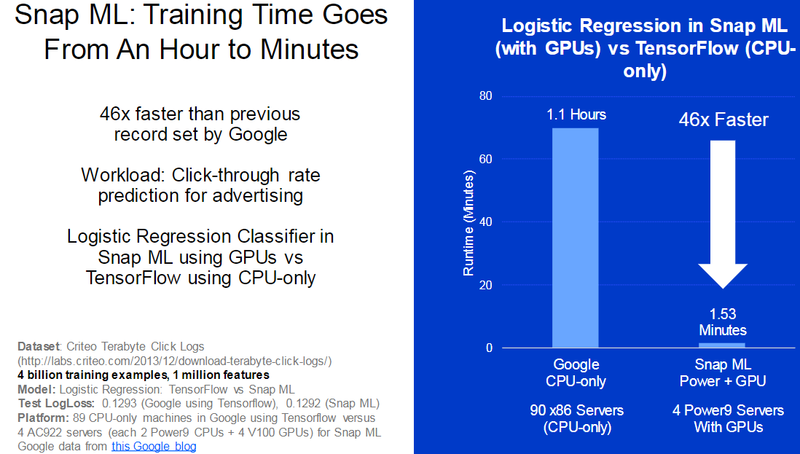 We have demonstrated that our library can remove the training time as a bottleneck for machine-learning workloads, paving the way to a range of new applications. For instance, it allows more agile development, faster and more fine-grained exploration of the hyper-parameter space, enables scaling to massive datasets and makes frequent retraining of models possible in order to adapt to events as they occur. 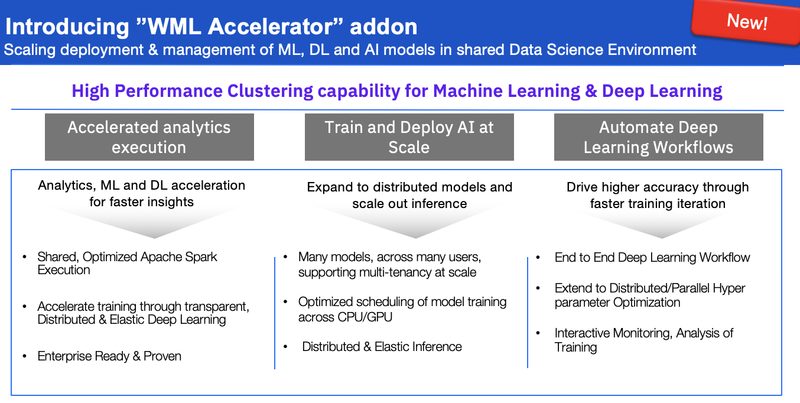 With Watson Machine Learning Accelerator as an add-on, Watson Studio and Watson Machine Learning clients deploying workloads on premises or for private clouds can now drive faster time to results for machine learning (ML) and deep learning (DL) workloads. We are tapping IBM’s pioneering history of innovation, in this case from the blend of software and systems from Power Systems to meet the today’s demands of embedding ML into business processes and modern applications. You can also read more here (greg’s blog) to learn what we are up to in all things machine learning. To learn more about how Watson Studio and Watson Machine Learning help your enterprise AI initiatives, please download ESG Technical Validation Paper on Watson Studio and Watson Machine Learning.